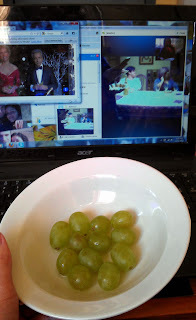 Not a great picture, and actually it's from last year... but I didn't do it this year and wanted to share about this Spanish tradition :) Instead of the regular countdown, we eat a grape with each ring of the clock when it's 12. The traditional clock to see it is in Madrid, at La Puerta del Sol, but it's done in many other cities and towns too. Since last year I wasn't in Spain either, I watched it online at Spanish time, while talking with my family and some friends via Skype. This year I went to the downtown in Marina Bay, in Singapore, but I didn't like it very much... but I never liked the countdown very much... I guess I'm used to eat grapes, which is much fun. I almost forget a song!! No es una gran foto, y ademas es del año pasado... pero este año no lo he hecho, y me apetecia compartir sobre esta tradición española. Como el año pasado tampoco estaba en España, lo vi por Internet a hora española mientras tambien hablaba con mis padres, mi hermana, y unas amigas que estaban en casa en Skype. Este año lo vi en Marina Bay, aqui en Singapur, pero no me gusto demasiado... aunque nunca me ha convencido mucho eso de la cuenta atras, supongo que estoy acostumbrada a comer uvas, que es mas divertido.